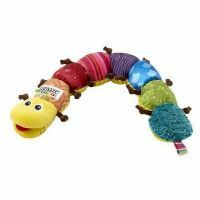 A soft Lamaze friend for baby to grow with! High-quality velour fabric. Royalty never looked (or felt) so good! Princess Sophie holds her jewels (clacking beads) in her hands for baby to play with and her skirt crinkles to keep baby's interest. Her bold colors and contrast prints help with visual stimulation and development.